Explore Communities | Perfect Choice Properties, Inc. Welcome! We invite you to explore our delightful state. From the Seacoast to the mountains, from small, rural communities to thoroughly modern small and medium-sized cities, the Granite State offers a community to fit every taste. With its strong educational system, its great variety of year-round recreational opportunities, and a multitude of beautiful (and reasonably-priced) properties, New Hampshire is ideal for families, retirees, first-time homeowners, second-home buyers, and all who dream of finding their Perfect Choice of real estate. Click a county on the map below to display county information and links to property listings by city/township. At the heart of the New Hampshire Lakes Region sits Lake Winnipesaukee, its 288 miles of winding shoreline in Belknap and Carroll Counties providing trails, fishing, beaches, marinas, boat launches – and waterfront properties that range from custom vacation homes to charming camping cabins. Year-round and seasonal residents enjoy picturesque waterfront paths in such Belknap County towns as Meredith, where the Lake Region's Winnipesaukee Scenic Railroad is based. Nearby Weirs Beach in Laconia hosts the renowned Motorcycle Week rally each June, the event's origins dating back to 1916, while revitalization in Downtown Laconia provides great opportunities for small businesses looking for main street communities in which to open their doors. Away from the water and commerce, the Belknap Range entices outdoor enthusiasts with four-season trails and the challenge of hiking all 12 of its peaks. For more than a century a retreat for Boston residents looking to escape the summer heat, Belknap County offers year-round beauty and activities for home owners. 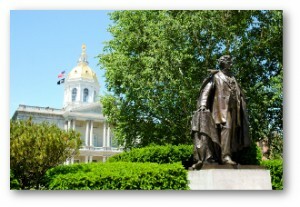 For population, schools, and other information on the New Hampshire towns and cities listed above, see their community profiles. With barely 44,000 residents, rural Carroll County – named in 1840 for the last surviving signer of the Declaration of Independence – is the second-least-populated county in New Hampshire. Carroll County includes part of the 750,000-acre White Mountain National Forest (which covers portions of Grafton and Coös Counties in New Hampshire and Oxford County in Maine). With Black Mountain, King Pine, Attitash, and Cranmore Mountain ski areas located in Carroll County, and numerous historic inns still in operation in the White Mountain region, recreation and tourism are the county's primary industries. One in five residents of Carroll County live in Conway, a major commercial center that boasts outlet shopping (New Hampshire has no general sales tax) in addition to tourism-related enterprises. Spurred by efforts of the Mount Washington Valley Economic Council, Conway's recent growth ranges from new restaurants and breweries to business parks geared toward technology firms. From first-time buyers interested in living near northern New Hampshire's commercial center to those seeking the solitude of the White Mountains wilderness, Carroll County offers many opportunities for finding that perfect home choice. Home to Mount Monadnock, one of the world's most-climbed peaks, Cheshire County features the kinds of New Hampshire town centers that resemble movie sets. Annual events such as Jaffrey's Scarecrows on the Commons and Keene's famed Pumpkin Festival beckon city-dwellers eager for a taste of autumn in New England. Established in 1735 by several dozen settlers who paid five pounds each for their land, Keene now centers around Keene State College and Antioch University. The city's lively downtown welcomes year-round and seasonal residents to boutique shops and tasty eateries. In nearby Rindge, Franklin Pierce University is another major education-related employer in Cheshire County, while the stunning Cathedral of the Pines serves as a backdrop for events from religious services to summertime Shakespeare productions. Its name derived from the Algonquin word for small pines, New Hampshire's sparsely populated Coös County (barely 33,000 at the last census) is a beacon for vacationers and home owners seeking the wild beauty of Northern New England and the Great North Woods. Home to Mt. Washington, world famous as much for its dangerously erratic weather as for the Victorian-era Mount Washington Auto Road, Coös County also includes a portion of New Hampshire's White Mountain region – providing seasonal and year-round residents with world-class skiing and hiking in their own backyards. New Hampshire's northernmost city, Berlin in Coös County less than 60 miles from Quebec, has the distinction of being the birthplace of both the casserole, in 1866, and North America's oldest ski club, the Nansen Ski Club founded in 1872. With half its land belonging to the White Mountain National Forest and portions of the Appalachian Trail passing through almost a dozen of its towns, New Hampshire's Grafton County is decidedly rural. Yet Dartmouth College and Plymouth State College are nestled here, too, alongside the historic working farms, independent businesses, and some of Northern New England's most beautiful peaks. From museum shows, music festivals, and theater to hiking and harvest fairs, Grafton County offers residents the opportunity to a rich rural-living experience where artisan crafts, education, and entrepreneurs are nurtured side by side. Close enough to Boston to drive in to the theater district or museums, far enough to enjoy country living... Hillsborough County offers seasonal and year-round home owners "the best of both worlds." And with the famous Peterborough Playhouse and the MacDowell Colony in their own backyard, theater- and art-lovers can enjoy events year-round in the community immortalized in Thornton Wilder's Our Town. 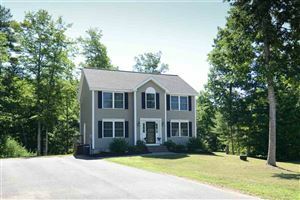 From mountain hikes and excellent cross-country skiing, to blueberry and apple picking at scenic family-owned farms, to easy travel access from the city of Manchester airport, many first-time home buyers find that Hillsborough County is the perfect choice for New England living. Merrimack County, New Hampshire, offers visitors and home owners activities ranging from downtown dining in the state capital of Concord to science education and wildlife photography in the John Hay National Wildlife Refuge. Luring walkers and cyclists in summer and snowshoers in winter, the Northern Rail Trail passes through five towns in Merrimack County, including Franklin at the junction of the picturesque Winnipesaukee and Pemigewasset Rivers. Founded in 1792, the Shaker Village in Canterbury is a major year-round tourist and educational attraction, inviting visitors to immerse themselves in the community's 200-year-old legacy of self-sufficiency and simple living. And for first-time home buyers and those looking for that perfect vacation property, the town of Dunbarton, soon to celebrate its 250th anniversary, has been identified as being the literal center of New England. Originally settled by Europeans in the 1600s, Rockingham County is the perfect choice for anyone seeking a year-round or seasonal home along the New Hampshire coast. From beautiful Portsmouth with its historic homes and thriving downtown streets filled with one-of-a-kind shops, galleries, and restaurants, to the town of Derry, birthplace of astronaut Alan Shepherd and site of The Robert Frost Farm, Rockingham County offers New England living an easy drive from Boston. New Hampshire's smallest county is home to the state's largest academic institution and a major employer. At the University of New Hampshire in Durham, seasonal and year-round residents enjoy concerts, plays, lectures, and sporting events. The oldest permanent settlement in New Hampshire, the city of Dover is located in a region originally inhabited by the native Abenaki tribe and first explored by Europeans in 1603. A leading textile manufacturer in the second half of the 19th century, Dover's impressive millworks and other historically interesting buildings now house such enterprises as the Children's Museum of New Hampshire, technology businesses, and restaurants. Many who call the charming villages of Somersworth and Rollinsford home today trace their ancestry to the early farmers, fishermen, and shipbuilders who lived along the Salmon Falls River that borders Maine (and offers pleasant kayaking and canoeing from public launches on both shores). With both the Seacoast and the White Mountains nearby, Strafford County is as rich in outdoor activities as it is in history. The county named for Revolutionary War hero John Sullivan is home to 14 towns and just one city, Claremont (population about 13,300). Commercially prosperous during the Industrial Revolution, Claremont is again emerging as an economic center. The architecturally impressive brick mills, once the source of textiles and paper manufacturing, and Victorian homes are finding new uses for businesses ranging from furniture makers to precision technology firms to restaurants and shops. Contrasting with the excitement of Claremont's revitalization is the Saint-Gaudens National Historic Site. Here, visitors and residents alike tour the home, studios, and gardens of Augustus Saint-Gaudens in the Sullivan County town of Cornish, where the acclaimed American sculptor lived until his death in 1907. Home to the Cornish Art Colony, the property is a favorite spot with locals who enjoy hiking its trails while taking in the original art on display. And like Augustus Saint-Gaudens, both year-round and seasonal residents are drawn to New Hampshire's Sullivan County for its natural beauty and relative seclusion.